At Neathawk Designs we are a sign carving business making unique one of a kind signs for businesses and individuals. We also make custom museum replicas. Before the start of this venture I was a graphic designer for a wooden toy company, then moved onto land development. CNC came into my life in 2010 when my husband was looking to buy a small one for his contracting business for cabinet making. 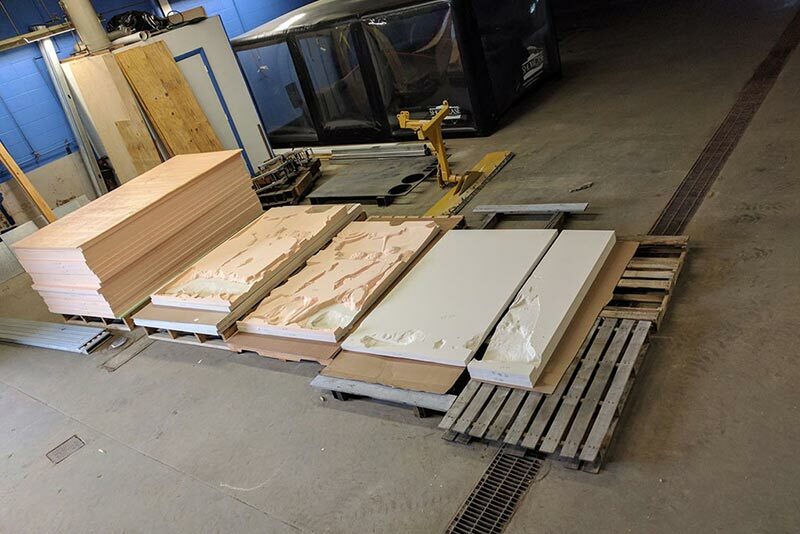 We purchased our first CNC in July of 2010 that had a 2×2 bed. Less than a year later we upgraded to a Shopbot 4×8 CNC when we almost immediately outgrew our smaller machine. 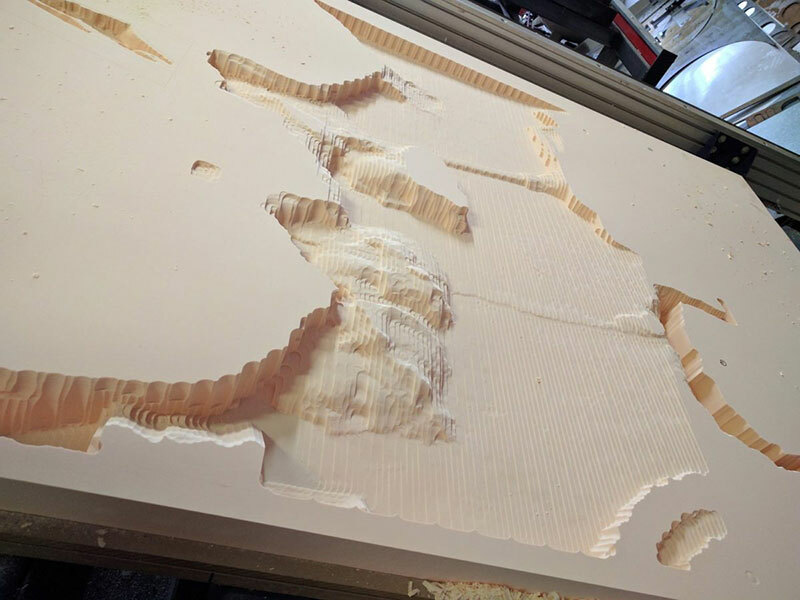 At first, I wasn’t too sure about using a CNC machine as I really didn’t know much about its capabilities as my husband was using it for such a specified use. But after watching the great tutorials that Vectric does and seeing the fun projects I could create I felt inspired. Like I said I previously had a CNC Shark but quite quickly outgrew the 2×2 bed size with the scale of the work coming in. So now I use the Shopbot, which luckily came with vcarve Pro. 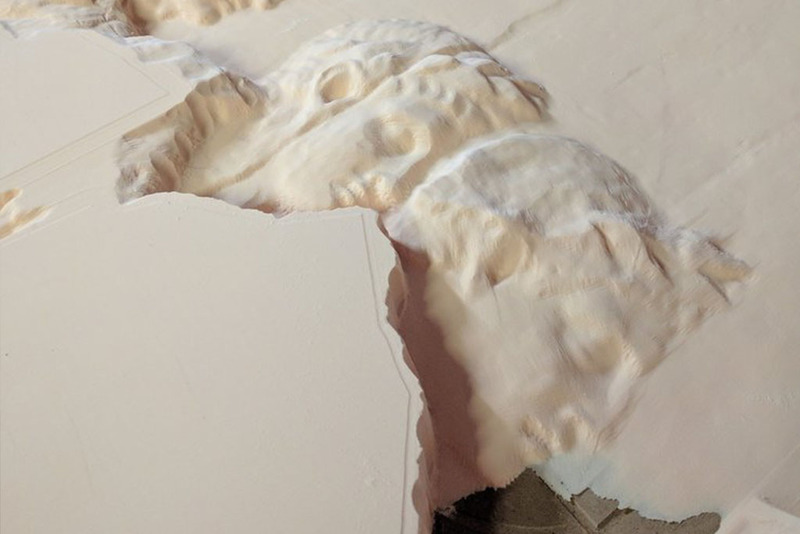 It didn’t take me long to upgrade from vcarve Pro to Aspire once I discovered what I could do with it, I use that primarily now for my sculpting and 3D work. To be honest there are quite a few things that I benefit from when using Vectric software but ultimately, it’s how user friendly the software is. Not to mention the video tutorials and great customer service (and technical support). 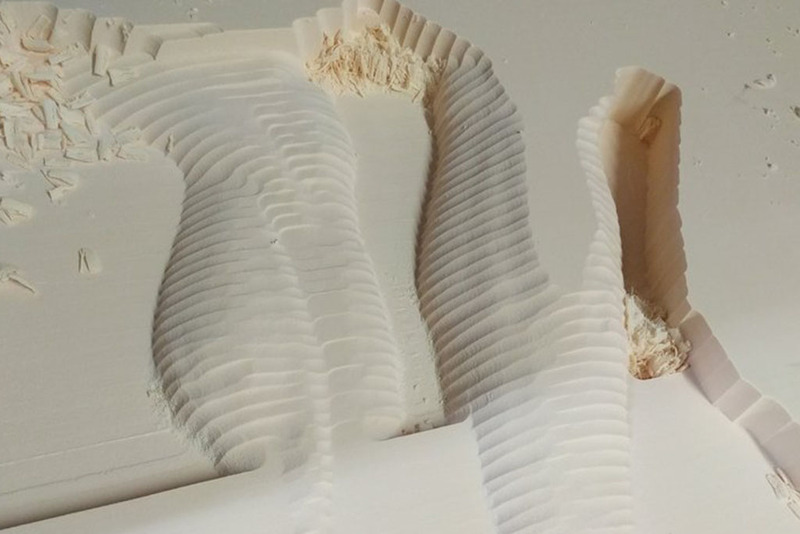 It’s clear to see that introducing a CNC machine into Lindsay’s arsenal of tools has enabled her to take on more creative and complex projects. 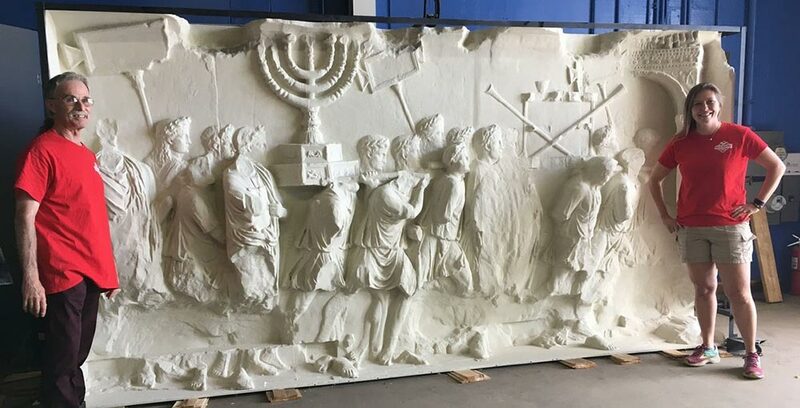 I was commissioned by Yeshiva University Museum in New York City to do a complete replica of a spoils panel from the Arch of Titus currently located in Rome, Italy. The size of the panel is 6.5 feet tall, 12.5 feet long, and 1.5 feet deep. 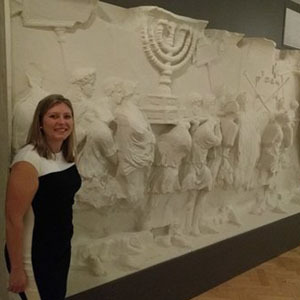 In 2012 Yeshiva University Museum sent a team to the actual arch to take 3D scans of the panel. The scans were then sent to Learning Sites, Inc. Where they converted to CAD files that I then imported into Aspire. Because our machine is only 4 feet wide, I had to have Learning Sites cut the panel into 4 sections. I used 15lb and 20lb HDU (High Density Urethane) that we got from Harts Supplyout of Boston MA. Once each panel was sent to me I was able to slice the panels into 9 layers. It took me a little under 2 weeks to work on the all 32 files and export all the layers to the shopbot machine to carve out. I used primarily a half inch end mill to do all the roughing of the panels. After I used a 1/8th inch ball nose to do the finishing. One of the most helpful sets of tools within the software was the 3D modelling. 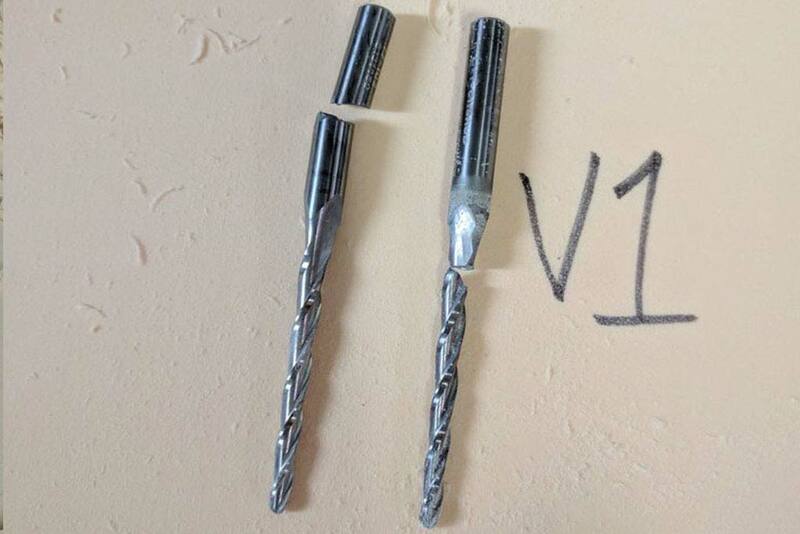 I relied on these immensely throughout the whole project to ensure complete accuracy. After the files were done it took about a month to carve all 32 panels working around the clock, 7 days a week. Once all panels were carved out, I spent a few weeks sanding, and gluing all the panels together. Then a few days to prime and paint the panel ready for shipping. I loved every stage of creating this piece. It’s hard to name just one part. At times, some not so much, because something wasn’t working the way I wanted it to, but it was fun to still figure out. If I were to do this project again I would slice the layers differently. 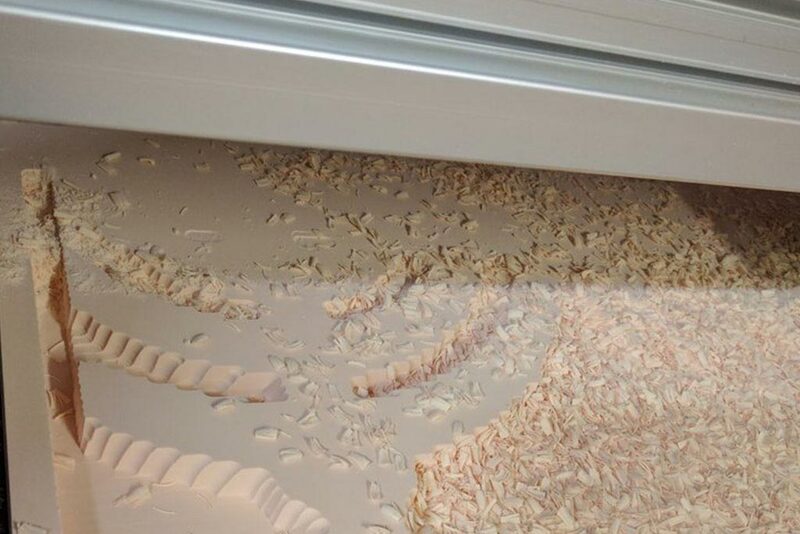 I would have sliced from top to back, so that there wasn’t as many “little” pieces to piece together at the end. What did work really well was the ability to see the panels in the 3D plane and know where they go once carved. If I could give one tip to anyone creating, don’t give up! I’m currently working on custom unique signs with wood and metal with my husband Ryan. 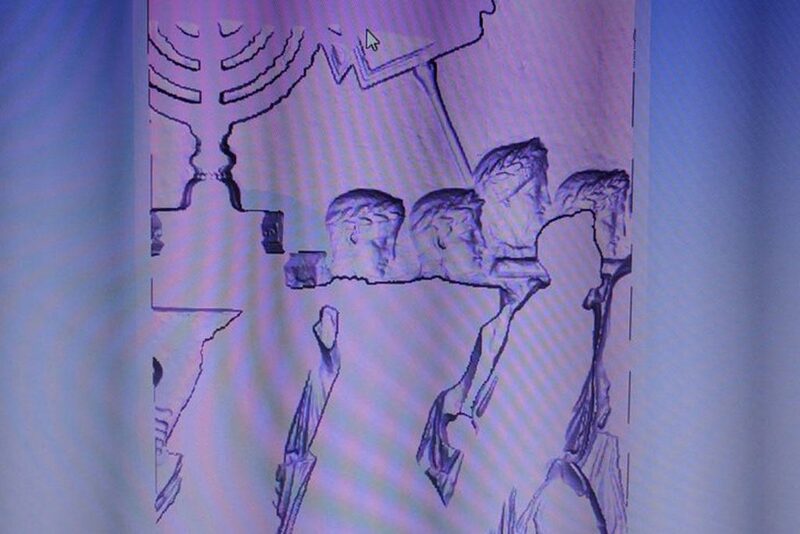 I’ve really been inspired by the fulfilment of creating the Arch of Titus piece so I’m figuring my next museum replica to make.